Vera Castleman who writes books on computer applications for schools, also writes stories for children. 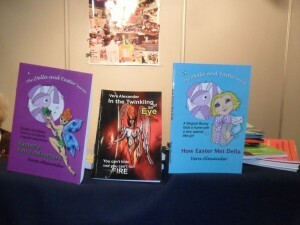 Her delightful Della Meets Easter series had two of the first books in this series launched at the Arts and Culture Language Festival at the ICC on Wednesday 21st of November. Vera also wrote a teenage short story called “In the Twinkling of an Eye” which she also launched. Easter is a toy bunny made by an old man, Jimmy, and delivered to a toy shop where he is scared by an unpleasant child who thinks her dog would like to throw him about and play with him. Easter is lucky as Della, a kind little girl, chooses Easter for her Easter present. This story with delightful illustrations is told in the first book, How Easter Met Della. Vera Alexander’s second book, Easter’s Fairy Adventure, takes place at a picnic in a fairy garden. When Della falls asleep, Easter hops away and has an adventure with two bunnies he meets but when the sun goes down and it’s time to go back to Della, Easter finds he is lost.